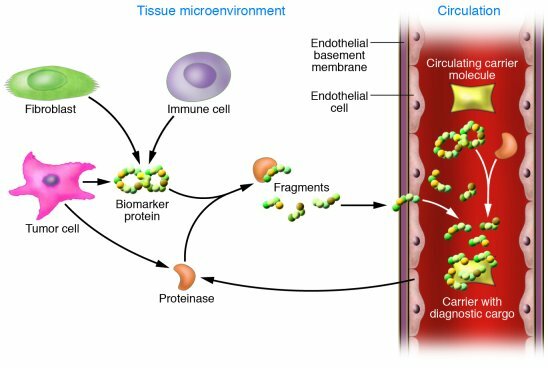 Circulating protein fragments generated in the diseased tissue microenviroment may serve as diagnostic protein markers. Proteolytic cascades within the tissue (a product of the interacting cellular ecology such as stromal-epithelial interactions), immune cell MHC presentation, or apoptosis generate protein fragments that passively diffuse into the circulation. Shed LMW peptides are protected from kidney-mediated clearance by sequestration on abundant resident blood proteins such as albumin. According to the results presented by Villanueva et al. (18) in this issue of the JCI, diagnostic protein fragments can also be generated ex vivo by circulating enzymes derived from the diseased tissue microenvironment acting on exogenously derived peptides produced by serum collection methodology (see Figure 10 in ref. 18).